Pausing to reflect is important. Indeed, it is. But only when the reflection is focused on the lessons learned in our struggles, the victories earned in our triumphs and the choices needed to move forward in a positive way. Pausing to reflect can be devastating if we're squarely focused on the negative consequences of our choices and actions. It's like constantly analyzing where and why we swerved off the road. If you're driving along and you skid off a slippery highway, finding yourself in a ditch, you might pause to thank God you survived. You probably would spend a minimal amount of time thinking about what happened leading up to and creating the loss of control. But then your main focus turns to what it must be in those moments: "How do we get out of this ditch?" When flashes of what to do now are clouded by constantly analyzing what went wrong, feeling bad about what happened and obsessing about how it could have been different, we become stuck. Truly stuck. Paralyzed by our thoughts, we sit and stew inside as the windows become covered until we can't see the road. Soon, disoriented, we lose our sense of direction. We know we can't give up, because staying here will eventually kill us if we don't act. Our basic instincts of survival demand we act and act now, if we hope to ever get out of here, we must act. That's where I've been. In that vehicle. I'm not alone. I have my hopes and dreams with me. I have the best of intentions with me too. I have family and friends who reach out and offer support and they believe in me 100%; they always have. If I were more clear with them, revealing my location, they would find me and once again their support would be fully received as it once was in the best of times. Instead, I sit here, feeling the sting of the cold as thoughts of my chosen consequences pierce me in every way I allow. I occasionally receive messages from people far and near who have read my blog, my book and facebook mini-blogs and they send some of the most incredibly positive stories about how my journey has affected them. They're on the road, hands on the wheel and thanking me for inspiration they've gleaned from my experience. Perhaps they haven't heard of my current dilemma. Maybe they have and they're hoping it motivates me to act and act now. I often find myself in tears while reading these, filled with happiness for them first, then reminding myself that this is all I want to do with my life; to be a positive light for others; to serve as an honest example of what's truly possible. Then, I become overwhelmed with guilt, withdrawing into myself, hiding from the truths I must embrace to get me out of here. This isn't a pity party. This isn't a cry for sympathy. This is the truth of where I am and it's a place I've kept myself by choice. No, not the best choice(s), obviously, but it's my doing. I'm responsible for me. I have little sympathy or compassion when I read about a blue chip athlete who has it all going for him, yet self-destructs before he realizes his ultimate goals and dreams. Or when they achieve incredible heights, only to fall quickly by way of their own horrible choices. Yet, I find myself in a similar place. If I'm not willing to give someone else sympathy and compassion in this situation, imagine what I'm doing to myself. I must have compassion for myself, self-forgiveness and an eye for the clearer road ahead. I have serious choices to make. Good choices. I have the tools readily available to emerge from this death trap and get back on the road to safety and positive leadership. Oklahoma's own Vince Gill once sang "There's no future in the past," and oh my, how true that rings. I can't go back in time and prevent what has happened, so why constantly obsess over the elements involved? I can move forward in a positive way, one choice at a time. And when I'm in similar positions someday, I'll appreciate the experience I've gained, giving me the strength and insights to be okay. Someone I truly care about recently told me to just "be okay." And it sent me in search of what that means. It sounds so simple. "No really. Just. be. okay." I want to be okay. I think it means to appreciate the positive blessings, let go of the negatives and move forward in peace. I think it means for me to have compassion for myself and others as I navigate the future in this direction, instead of wallowing in the maze of my past. I think it means to stop trying to figure out how to undo what's already done, like it never happened--and make positive steps toward a future where the same mistakes are not repeated. Just be okay. That's where I am. I'm working on being okay. I'm reaching for the door handle leading out of this place. The sun shines on the other side of this door. Why would I choose to stay in the darkness? There's fresh air out there, there's love, there's peace, there's family and friends...there's hope and promise. I've deflected every inquiry from family and friends about what I want for Christmas. I simply want peace. I simply want to be okay. And this Christmas wish isn't something anyone else can give me. I'm here. I'm choosing to release myself from the imprisoning thoughts of yesterday. I'm choosing to live today. I wish you the best Christmas wish I can, that you find peace, love and most of all, you find yourself being okay. Thank you for reading, my friend. Thank you for your incredible support. Thank you for believing in me. Thank you for being you. It's hard to believe this is my fifth Thanksgiving since starting along this road. I started with a 5K at the stroke of midnight and I'll do another late afternoon in between dinners. Yes, dinners. I'm traveling to Stillwater with my daughters for a mid-day dinner with mom and family, then back to Ponca City for an evening version with my daughters at their mom's house. There will be food. Plenty of food. How does this food addict make it through Thanksgiving without spiraling into a months long bender? Knowing my limits is key. In weight loss mode or maintenance mode, I must have a limit. I'll allow 2500 calories, if needed. I say " if needed" because I remember a few years ago getting late in the evening and eating more simply for the sake of hitting 2500. That's silly. I'm in weight loss mode and much less likely to be silly this year. I'll still avoid certain high-calorie, high-fat and super sweet things, like pecan pie and, uh...pecan pie. In all fairness to pecan pie, it is delicious indeed. The first four Thanksgivings along this road, I thought I was avoiding pecan pie based on caloric value alone. I now understand there's more to it than that. I'm avoiding it this year for the calorie value reason, plus--with its super rich sugar content, I'm confident it's one of my trigger foods. I'll eat reasonably and my plate(s) will be an example of what doesn't trigger my urge to binge. I'll have some turkey breast, a normal size portion of mashed potatoes, a small portion of dressing, some vegetables and even a slice of pumpkin pie. Maybe a roll, maybe not. I've never been a big bread person. We're all different. What doesn't trigger me may send you reeling. Noticing, being aware and honestly assessing our individual limits is paramount to our success. The conditioning that Thanksgiving must be a holiday where everyone gets stuffed beyond reason is ridiculous to me now. It is traditionally centered around food, but that doesn't mean I have to conform to tradition. I will keep my focus on the best parts of Thanksgiving--the family, the love and the many blessings in my life. The food will take a back seat, a minor role. The food will be good, no doubt, but I will not make it a day all about food. I will make it a day all about living. If you're celebrating Thanksgiving today, make it one to remember for all the best reasons. I'll do the same! This picture is from last holiday season. I had been at goal for just over a year. I look at this picture and realize getting back there isn't really that far down the road physically. It is worlds away mentally when compared to the struggles of the last six months. I'm so thankful today for the hands extended me while reaching out recently. With strength from above and amazing support from so many, I'm choosing change. And I'm doing it with new information about my strengths and weaknesses. 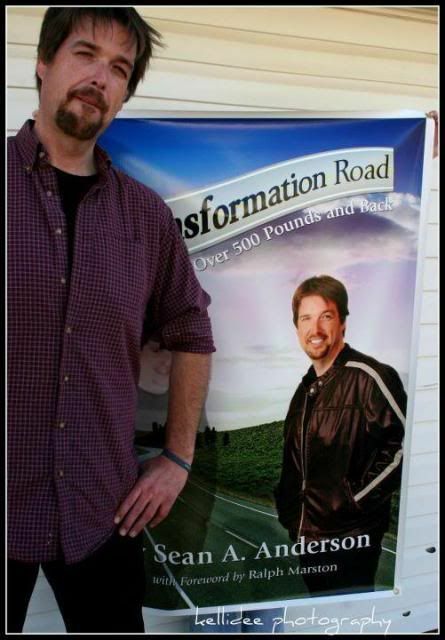 A life forever free from the chains of obesity was once just a dream. I'm wide awake now and learning what it takes for the forever part. My life has had many ironic twists along the way. A running irony is how my job sometimes requires me to be a salesman of everything from different restaurants to grocery items. Yep, that's me talking about the new pan pizza with its "double layers of cheese and toppings all the way to the edge." My voice shifts into a slightly seductive tone as I try my best to convince you to try this pan pizza masterpiece. It's my job. It's what I do. In the "zone" I never really gave it too much thought. Recently, I've spent more time examining the many facets of me while in the depths of struggle. This slice of irony keeps rising in this introspective study like the fresh-never frozen pan pizza dough I've been talking about. I was approached by the manager in my last broadcast hour requesting that I promote the new Blue Bunny Heath Bar and Reese's Ice Cream Cakes. I'll tell you right now, the Heath Bar Ice Cream Cake---it's like the new recipe department at Blue Bunny was aiming straight at me with this one. One of my biggest weaknesses over the previous six months of struggle was the small Heath Bar Mix at Braum's Ice Cream and Dairy Store. Want to read some crazy rationalizations? It's a small--made with low fat frozen yogurt--only 450 calories-- It started with an occasional small. With a food addict like me, it never ends as a once every month or two treat or something reasonable. Nope. At my worst, I would order the large--a whopping 700+ calories in one cup. I would grab it--then look around as I drove away, hoping nobody spotted me getting my fix. Then, as if I was being followed and trying to shake a tail, I would wind my way through the residential blocks separating me from my apartment--or my dungeon of guilt and shame, if you will. I will not allow Heath Bar Mixes into my life again. Not a portion, not a bite, not once every month or two--not ever. I'm finally accepting the deepest, most important truths of my food addiction. And that is this: There are some things--especially items with concentrated fat and sugar, I must abstain from for the rest of my life. Period. Anyway--back to the manager and these Blue Bunny Ice Cream Cakes. He asked me to promote the free samples and coupons they were giving away to shoppers. He even invited me in to try it so "you can tell 'em how good it is..." Uh, yeah--no thanks, I can easily do this without having a sample. It's ice cream and a candy bar--it kind of sells itself. He also gave me a three dollar off coupon to serve as a reminder for the promotion. Now, I assure you I didn't go anywhere near the free samples. I didn't buy one either. I talked about these new cakes from Blue Bunny and how wonderful it would be for you to have one ready in the freezer when your company arrives this holiday weekend. I sold it. I sold it very well. I almost sold myself. I did. I wanted it bad. The picture on the coupon promised it would be even dreamier than the frozen yogurt mix Braum's deals from their drive-through. This is premium ice cream and Heath Bar. My mind started racing as it tried to find some kind of out, some kind of rational thought that would excuse such a deliberate act of indulgence. I knew, if that new cake found its way into my apartment, I would destroy it in short time. And I knew I had to stop and ask for help. I have friends who will ask why I didn't stop and call them in this moment. And trust me, my friends--you'll be getting calls like that from me, I'm sure. Because I'm not throwing away my life over an ice cream cake, a new pan pizza or the sesame chicken from the Chinese Express. I stopped and said a prayer. Out loud. I took a deep breath and headed home. This isn't easy. In fact, I find it more challenging than ever. It reminds me of a wonderful moment I had during my first year of weight loss. My phone lit up with an "unknown" and I almost didn't answer. I'm glad I did because it was one of my heroes, Richard Simmons. We talked for several minutes and I casually mentioned "lusting" over food. And he replied, "don't we all!" I didn't fully appreciate what Richard meant until now. Being strong willed, being in the zone, having weight loss success---all of it doesn't keep us from being human. And in our own human state of being--enmeshed in our own way of dealing with emotions and circumstances, the allure of escape with food is powerful. Standing up against this powerful force requires calling upon a higher power and sometimes, simply calling a friend. We can overcome. We can be equally as powerful in our good choices. We can arm ourselves with details exclusive to who we are and how we're affected--then navigate the wonderful world of food with a little less fear and a whole lot more knowledge. I'm getting stronger everyday. I'm slowly moving toward regaining consistency in my workouts and I also plan on devising a new weigh day schedule to be unveiled in the coming days. As for the ironic workplace "hazards" mentioned above, I'm okay. I love what I do for a living and I know I'm very blessed to be able to do what I do. My dream of writing and speaking more often about weight loss and the powerful dynamics along this road will come true and will be my full time job someday. Just not today. In the meantime I'll be the sugary suggestive voice you might hear, doing my best to sell you ice cream cakes and pizzas. If you're a food addict like me, please feel free to turn down the volume. Yesterday was my two year anniversary of hitting goal. (Click here to see the post from Goal Day) It was a magical day I'll never forget. I had mentioned it earlier in the week on facebook, yet I DID forgot about it all day yesterday. It was a very busy Friday in radio land with my morning show, commercial production and a remote broadcast from 1 to 5pm. Not once did I reflect on the significance of the day. I focused exclusively on staying within the limits of my calorie budget. It's appropriate really. I've spent way too much time celebrating my victory and not enough time taking care of myself in order to maintain. Instead of celebrating yesterday, I was planning my strategy for a successful food day. I was staying in the present. Being aware; realizing these are critically important times for my development is a constant focus. I made sure to get up early enough to prepare and pack items to get me through an eleven hour day. I started with an egg white/mozzarella/turkey bacon breakfast taco with a couple extra strips of turkey bacon. I packed apples, carrots, and yogurt as snacks for the long day ahead. I came home and prepared lunch right before my 1pm broadcast. A good lunch was exactly what I needed, insuring I wouldn't feel hungry when the free pizzas arrived during the event. Because yes--free pizzas, and plenty of them are a regular feature of many of these. Of course hunger, with or without, hasn't necessarily been a binge factor to me. In other words, I never had to be physically hungry to dive into a binge. Not being hungry during the broadcast would be one of the elements helping me avoid the free pizza table, but really--probably the smallest element. Learning how I react to certain foods has been and continues to be an ongoing education. 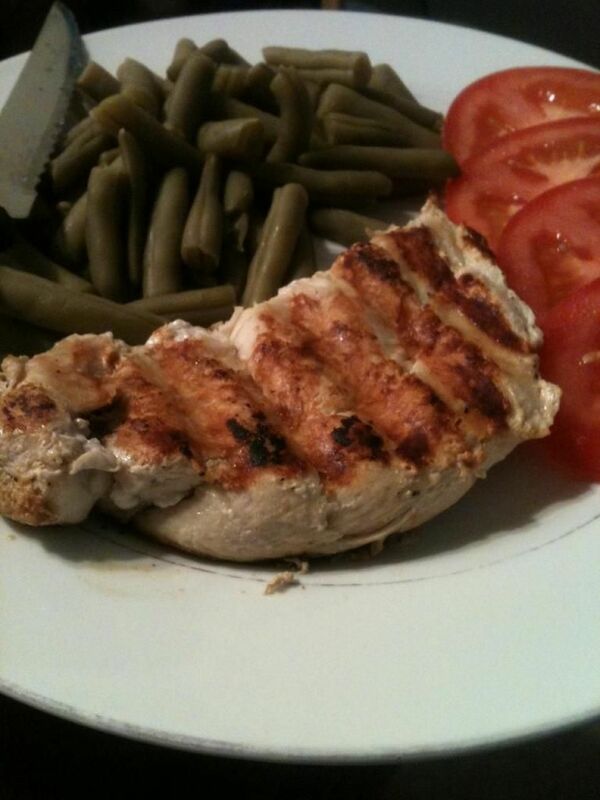 Identifying my personal trigger foods is invaluable information for my continued success. Identifying foods and meals that satisfy me without torturing my resolve, without triggering the compulsive side is equally important. This lunch was a delicious 300 calories. It was satisfying and it didn't send me into a feeding frenzy fight for my life. I ignored the pizza table at my broadcast. Two different people suggested "better grab some pizza" and "there's pizza back there..."
Yeah...I know exactly where to find the pizza. I also know where I want to be mentally and physically and a mid-afternoon pizza snack doesn't fit into that plan. "Thank you, I'm good" was my response. By the way--My broadcast was at a water company. It was a nice reminder to up my water consumption. Getting enough water has been an ongoing challenge over the last four years. I finished my day with turkey burgers (yes two) and a late walk in the park. It was a very nice anniversary day. The past two days have been extremely good. I've stayed within my calorie budget and exercised both days. I've started each morning with spiritual prayer and meditation. I've taken time and care in planning my food strategy too. I once again feel strong and confident. I feel driven in a positive direction. I've been inspired, motivated, moved to tears and absolutely energized by the outpouring of support. I actually planned on returning to regular blogging sooner--in fact, shortly before my 41st birthday October 23rd I proudly proclaimed on facebook my return to regular blogging as a "birthday gift to myself." My birthday came and went and still I avoided this blog page. I was truly scared of what I might find. Fear of rejection. Fear of being called a fraud. Fear of being reminded of some of my very own words, like "knowing too much to ever go back" and "nothing is off limits," among other writings and beliefs in the archives of this blog. It's important to remember something else I've said from the very beginning: I'm not an expert and I don't know everything. All I've learned along this road continues to evolve and with experience and more learning, becomes subject to modification. It's like transformation experimentation. These irrational fears couldn't have been further from the truth. In fact, the opposite is the true reality. And this is where I realize something critical. I needed this relapse. I needed this challenge. I truly needed to be humbled and shown the truth of my addiction once again. I needed to learn more. And I'll remain open minded and learn still more as we go. Where I found myself and where I find myself today was and is imperative to my growth toward my ultimate goals and dreams. Words cannot express how grateful I am for your understanding. In the middle of the last six months, I started to worry about the very real possibility of returning to 300, 400 or even 500 pounds. When you're feeling so lost and hopeless, it seems like the only possible outcome. In the depths of a spiral, it's like we're divided into two opposite personalities. It's a classic good vs. evil struggle. If we're discouraged, depressed and failing to plan, this weakened state makes standing up against inexplicable compulsions almost impossible. Giving in weakens us even more until we're totally dominated. At this point, the hopeless feelings; the idea of never finding a way to once again grab control becomes oppressive, all consuming, desperate, suffocating and lonely. If this is where you find yourself, you're not alone and it isn't hopeless, I promise. Reach out, first spiritually--in whatever way that means to you, ask for help. Then, reach out to anyone around you, far and near by giving your struggle a voice. It's incredible how quickly this can snap you back into the mindset needed to break free again. Over the next however long it takes, I'll return to a healthier body weight and I'll do it with a greater appreciation and respect for the dynamics of food addiction and emotional compulsive eating. I'll also work on being a little more compassionate toward me. Several have noticed how harsh I can be on myself. As one put it, "You treat others with so much compassion, yet you have little for yourself." Wow... They're right. This will be another well learned lesson along the way. In the tradition of this blog, I look forward to once again sharing many pictures, videos and various other elements along the way. Tonight, before I wrap this up--I wanted to share a couple of photos of me with very special people. 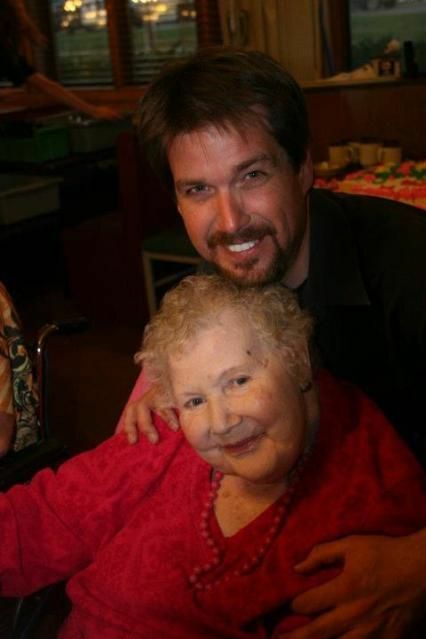 My maternal grandmother (Edith Irene Anderson) passed away in May. I've written about her and posted pictures of her throughout the journey, so I wanted you to know. 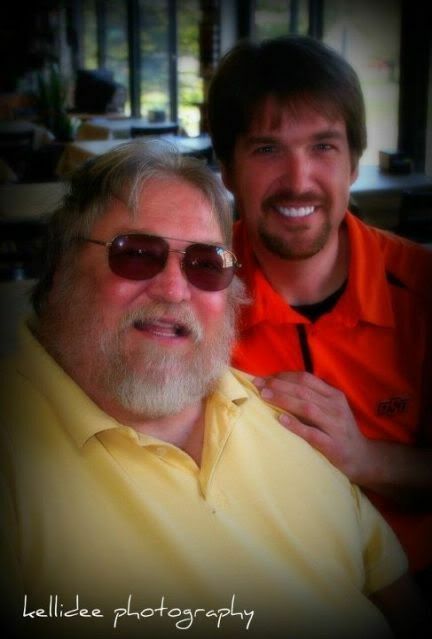 My big brother Clarke Hodson also passed away in early September. Clarke was my big brother in the Big Brothers/Big Sisters program. If you've read my book, then you might remember the six or seven paragraphs where I described my relationship with him. As I approached goal, grandma would advise "don't you lose another pound!" It was her loving way of saying she loved me unconditionally. And she did, at 505 or 230--no matter, I always had her love and could feel how incredibly proud she was of me. She would often talk about the time she enjoyed watching me sing on stage with the Poncan Opry Band. Even though Alzheimer's disease was robbing her memories, it was one of the few that remained. I was incredibly honored when the family insisted I be with them during Clarke's funeral. I was such a lucky kid... The program could have paired me with anyone and I was fortunate enough to get to know Clarke. Hey, my old friend. Good to see you again. We accomplished so much together. Remember Day 135, that letter, oh my...one of my favorite times with you, indeed. Day 327 was a game changer... and, and the day we hit the 200 pounds lost milestone, I'll never forget it! And of course, November 16th, 2010--goal day...wow, I could hardly believe how far we had traveled. I remember looking in the mirror and barely recognizing the reflection. Can you believe it's been two years since goal day? I know, I know...we're not here to revisit the glory days of this transformation. I owe you so much. I've missed you. Oh, I know you've always been here, it's been me avoiding you. I need you now more than I did before. I've been lost, so deeply lost---spiraling out of control, into an abyss I thought I'd never see again. I've tried over and over to pull myself back onto the path and still, the self-destructive tendencies of addiction pull harder. It would be easier to accept had you never shown me the truth. I can no longer escape the truth and wisdom you've gifted me. I can't keep running from you, hoping I'll wake up and magically feel like I did before. I need your strength because I'm not powerful enough on my own. I surrender. I'm holding out my hand, please pull me up. I don't want to go back there ever again. Please keep me in your embrace. I'll listen, I'll learn, I'll be patient and I'll share. You know my heart. You know my truest desires and passions to overcome and spread a message of hope to anyone and everyone battling obesity, especially those like me, the food addict-emotional/compulsive eater. Maybe this is a test you're giving me. Maybe you're tired of me ignoring you and foolishly trying to be all powerful over my addiction. I dare not question you. You know what? Maybe I should simply stop trying to figure out the why and how I've found myself here and simply be grateful for the hope, love and strength you so generously provide. Thank you for every blessing you've given me. I'm ready to fully regain control and I can only do it with your strength and guidance. Thank you for humbling me. Thank you for getting my attention. Thank you for loving me unconditionally. My heart burst with gratitude, Lord. The last six months have gone by so quickly. I've learned a valuable lesson, many lessons actually and it's only now I feel I can honestly sit down and write it out, honestly. As I started to slip, I kept telling myself it would be okay and I could easily get back into my groove. And I would, for a day or two, maybe three...then I would slip again. I walked with a foolish confidence, full of pride in my accomplishments while ignoring inarguable truths that had brought me so far. I would often turn to facebook and write something brimming with truthful realness in hopes of inspiring myself. You might have thought those uplifting and inspirational posts were written exclusively for others...not entirely...oh no. And then I started sharing my struggles--hinting at a much worse reality, but still not fully acknowledging just how bad it had become. Remember this one? "The key to maintaining my weight loss is squarely on my ability to understand my needs in coping with stress and emotions. I must always understand food's role and my role. Food isn't a therapist. Food doesn't fix my issues within. It's my responsibility to work on my issues in handling and understanding stress and emotions in a very direct way. Food cannot and will not be used as an escape from this responsibility ever again." "Despite the glaring truths revealed along the way, I sometimes struggle by foolishly searching for comfort in food. Knowing the truth about emotional eating doesn't mean we're immune or somehow “cured.” With personal awareness, acknowledgment and support, we can overcome. Facing my own personal awareness and finding your support has been a wonderful gift. Now, I'm once again feeling the comfort that comes with consistency in my Calorie Bank and exercise choices. And that kind of comfort is so wonderfully wholesome instead of deceptive, shallow and fleeting." "Dear addiction: When I'm feeling lost and alone, I reach for you. Let me have you in this moment so I can feel good again. I'll pull you to my lips and taste your temporary and deceptive relief from my pain. You taste so good, but the flavor quickly fades, replaced by a darker reality than before. I must resist your temptation and realize, it is not you tempting me, it's the tempting allure of escape. The road to freedom isn't down this dead-end street, yet I make the turn. I pray for strength against these damning compulsions. I stare myself down in the mirror, wipe away the tears and choose change. I'm stronger for the moment, until these emotional and circumstantial realities gain ground again, just as I grow weak. The process repeats, creating struggle--and it will over and over, until I confront, dissect, better understand and find a peaceful accord inside me, thus aligning with my truest self. You see, addiction, I'm on to you and your deception and I refuse to let you win. I'm winning, okay? You hear me? I'm winning." As I fell deeper and deeper back into my addiction, I started feeling like a disgraced evangelist. I was spreading positive energy, truth, wisdom and hope one day then cruising up and down restaurant row looking for a fix the next. People know me around here. More copies of my book have sold around here per capita than anywhere. Rarely a week goes by when someone doesn't come up and tell me how they enjoyed the book. And that kind of feedback feels good when I'm doing my best. Anytime it's happened in the last six months, it's been slightly terrifying, because--What if they notice I've gained some weight? Did they see me ordering that 750 calorie dessert at Braum's? I fell back into the same patterns as before--hiding my addiction, escaping--sabotaging myself and relationships along the way...straight into another drive through where my dealer awaits. My dealer doesn't ask questions. I give them the code number A21 and for $5.86 they hand me roughly 2500 calories of sesame chicken and fried rice. I tell myself I'll just have a reasonable portion, but I know I can't stop. I also know there isn't a reasonable portion of this, for me. The poison I've chosen holds the perfect combination in unlocking the floodgates of my addiction. It's battered and deep fat fried then coated in a sugary sweet and slightly spicy sauce. I've come to realize several foods to be my "trigger" foods, but none quite like this dish. The combination of sugar, fat and carbohydrates is a deadly mixture for me. If I were an alcoholic, it would be a bottle of Jack Daniels--and I can't allow myself to smell it or even have the tiniest taste. After indulging--the high sets in...I can feel my heart beating faster. I hadn't paid much attention to the physical reaction of binges past, but now--every beat of my heart is a reminder of a place I promised I would never visit again. Releasing my special "I'm Choosing Change" leather adjustable bracelet was a brief turning point. I put it on and felt a renewed power. I would wear it, looking at it constantly during moments of weakness. Eventually, I realized my struggles, my choices---my compulsions, were very much choosing change, but not the kind of change I had in mind. In a state of self loathing, I recently took it off because I felt I was disgracing its powerful message in my wandering ignorance. The physical symptoms of my struggles have shown themselves in every way you can imagine. When my size 36 jeans started getting too tight, I would squeeze into them anyway, until I couldn't anymore. I ended up wearing more forgiving wardrobe choices, like workout pants. Not because I was headed to the gym, because they wouldn't cut off my circulation and complicate my breathing. When shirts started getting tight, I quickly retreated to the same technique I once relied on as an obese child: I started wearing a warm sweater jacket to "cover up" the evidence of my gain--even if it was too warm outside for such a choice. Getting fitted for a tuxedo was another real moment. Realizing I had gone from a 46 long back into a 50 long in a matter of months was sobering--truly depressing. And all of a sudden, instead of loving the camera for the first time in my life, I found myself hating it again and the truth it was quickly starting to reveal. “The illusion that food somehow makes my troubles and stress easier to handle is gone. The tendency to abuse food like a drug is gone. Does this mean it's some kind of effortless day to day existence? ...Instead of making food my number one focus and my number one go-to in the face of stress and emotions of every kind, I will remember to appreciate food and what it does for me. I will not ask food to be something it isn't. Food isn't a therapist. Food doesn't fix anything other than my hunger and nutritional needs. When I remember to stop putting inappropriate and unrealistic expectations on food, my dream of maintaining a healthy and appropriate relationship with food becomes easier to navigate. So, what in the world has been bothering me so much over the last six months? In other words, what emotions and circumstances have I been avoiding and stuffing with food? I'll not go down the list for a couple of reasons: 1. Treating my emotional and circumstantial realities like a list of excuses isn't appropriate. I'm attending weekly therapy sessions and they're proving to be extremely helpful in gaining a better understanding of me on levels I hadn't explored. I highly recommend counseling of some kind to anyone wanting to explore and face facets and patterns of their life that are sometimes very hard to understand. 2. Sometimes the issues are simply too personal and writing about them, again--would read like a list of excuses and in my opinion would be considered inappropriate, or "tmi" content. So what about now, today? How much have I regained? I've avoided the scale for a very long time. I've even told close personal friends the gain is around 30 to 40 pounds or so. I recently weighed again and discovered the truth. If I'm to reclaim my freedom from this relapse--blog about it along the way and enjoy your generous support, then you need to know and deserve to know the truth of where I am. 289. A 59 pound gain. It could have been much worse. My intermittent awakenings over the last six months must have kept it from becoming a 100 pound gain... I don't know. I'm very blessed to be present again, aware and moving in a positive direction. Here we go, my friend. If you're struggling too, please join me--I'll support you too and we'll choose change together. This time, I'm armed with new information about myself. I'm not Superman and I don't have to be... I have a higher power I'll lean on for strength. And some of the most incredible friends all over the world offering support. You're a wonderful blessing to me. Thank you. Also, I've finally admitted that although I once proudly proclaimed "Nothing is off limits," there certainly are some things I must declare off limits for me. A21 at the Chinese Express isn't an option for me, ever, for any reason. I just put on a new "I'm Choosing Change" bracelet. It feels good.